There are plenty of reasons to be concerned about the future of our profession. Automation, regulation, demographics, the fact that fewer young professionals are choosing to become CPAs — factors such as these leave many accounting and finance pros wondering what we have to do today to remain relevant tomorrow. If you were at M&T Bank Stadium in Baltimore last night, though, I’m guessing you’re a lot more optimistic about our profession’s future today than you were yesterday. I solemnly swear that I will assume the responsibilities and obligations as a certified public accountant in the state of Maryland and in the United States of America. I will support the laws and regulations and perform my professional duties to the best of my ability in an ethical, professional and objective manner. As a CPA, I will uphold the honor and dignity of the accounting profession and abide by the rules of professional conduct. The oath is strictly ceremonial. 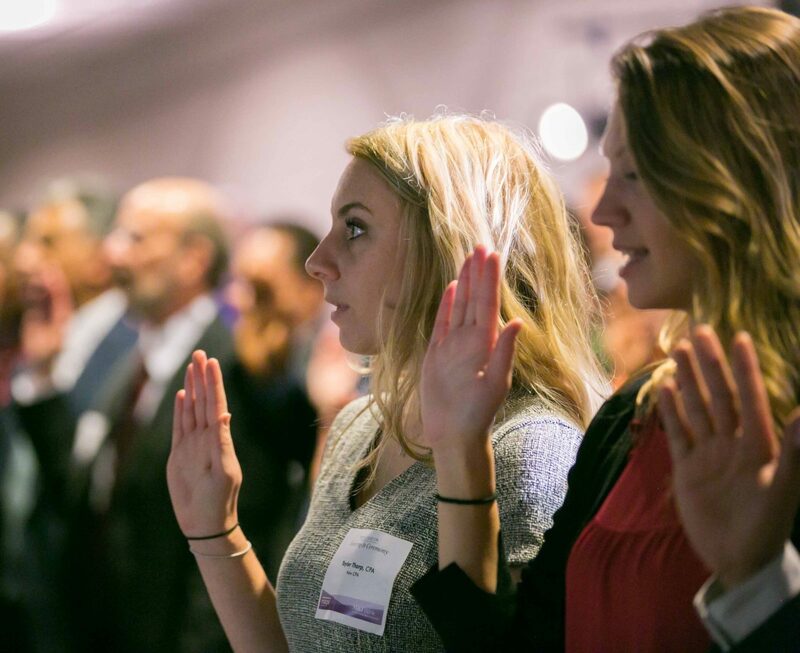 New CPAs don’t have to take the oath before launching their careers. their families an opportunity to celebrate their accomplishments, but it forces those attending to actually verbalize their commitment to serving the public. Passing the exam and earning your license is one thing. Standing in front of state and federal regulators, raising your right hand and promising to do the right thing is a much more powerful step. I’d be willing to bet it’s one the new CPAs will remember when faced with professionally and morally difficult decisions. Then there’s this: When you talk to the new CPAs, you quickly realize how much the event means to them. Previous “Swearing-In” participants have called the event “the exclamation point” on their years of studying and exam preparation, and “the most important experience” of their lives. This year’s event included remarks from AICPA Chair and MACPA member Kimberly Ellison-Taylor; current MACPA Chair Ken Kelly; Maryland Board of Public Accountancy Chair Art Flach; Maryland Department of Labor, Licensing and Regulation Secretary Kelly Schulz; and MACPA Executive Director Tom Hood. The pride in their accomplishment was transparent during last night’s event. Let’s hope they wear that pride on their sleeves throughout their careers. Congratulations, folks, and welcome to the profession.